UCF Wrestling Club members spent several days in several neighborhoods cleaning up. Earlier this week UCF President John C. Hitt talked about the compassion and character of university faculty, staff, administrators and students in the face of a crisis like Hurricane Irma. 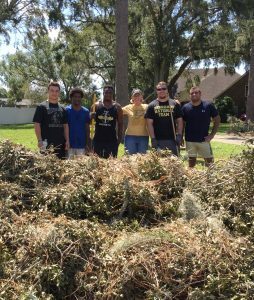 After Irma tore through Central Florida, the UCF Wrestling Club members put that empathetic spirit into action. Twenty members mobilized to help clean up the hardest hit communities in the area. It all started with a flyer the team created and then canvassed across Central Florida from east to west. UCF to Downtown Orlando to Windermere, requests for help came in by the dozens. Nearly 80 in all. The team responded on a first come first serve basis then headed out to help. They cleaned up debris from streets and yards, and moved tree limbs onto curbs outside the homes of several families. Sport Clubs is one of six program areas at the UCF Recreation and Wellness Center. The Student Government Association supports and partially funds the program. For more information about the program, contact Coordinator Andrea Snead at 407.823.2408 or andrea.snead@ucf.edu.